Paris (VNA) – A requiem for Vietnamese soldiers, who died during a battle to defend Gac Ma Island in Vietnam’s Truong Sa (Spratly) Archipelago in March 1988, was held at Khuong Viet Pagoda in France on March 13. 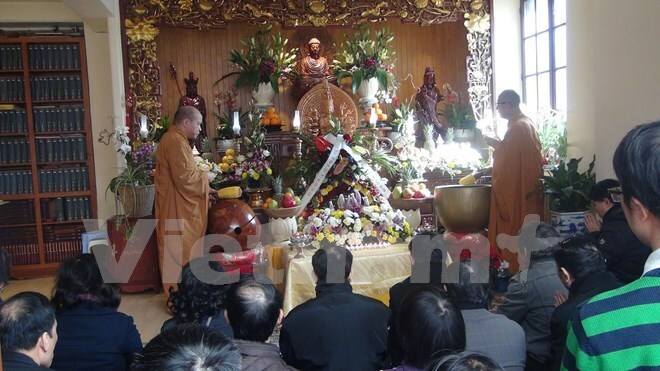 Buddhist monks and nuns at the pagoda together with overseas Vietnamese in Paris and vicinities paid tribute to the deceased and prayed for national and world peace. Venerable Thich Tinh Quang recalled the March 14, 1988 event when 64 Vietnamese soldiers sacrificed their lives to safeguard the country’s sea and island sovereignty. He told Vietnam News Agency’s reporters that he hopes Vietnamese people at home and abroad will be aware of their responsibility to defend the country’s land.